One of the scariest things about having surgery is that you don’t have any control over what happens, and technically, neither does your doctor. Although everything may seem fine on x-rays or MRIs, and all of your pre op testing could show you’re low risk and everything should go smoothly, on any given procedure, things can go left. The doctor could find more of a problem that s/he expected, or a problem they weren’t anticipating at all. You could have a reaction to some of the anesthesia. Your doctor could make a mistake. Your doctor may depend on the research and information on a particular technique or tool used in surgery, only to find later there are risks and side effects not previously known. We’ve seen this with the DaVinci robot, and now with power morecellation. A morcellator is a surgical instrument used for division (morcellation) and removal of large masses of tissues during laparoscopic surgery. It can consist of a hollow cylinder that penetrates the abdominal wall, ending with sharp edges or cutting jaws, through which a grasper can be inserted to pull the mass into the cylinder to cut out an extractable piece. So basically, a bladed, surgical instrument. Morecellators are often used with laparscopic hysterectomies and myomectomies. 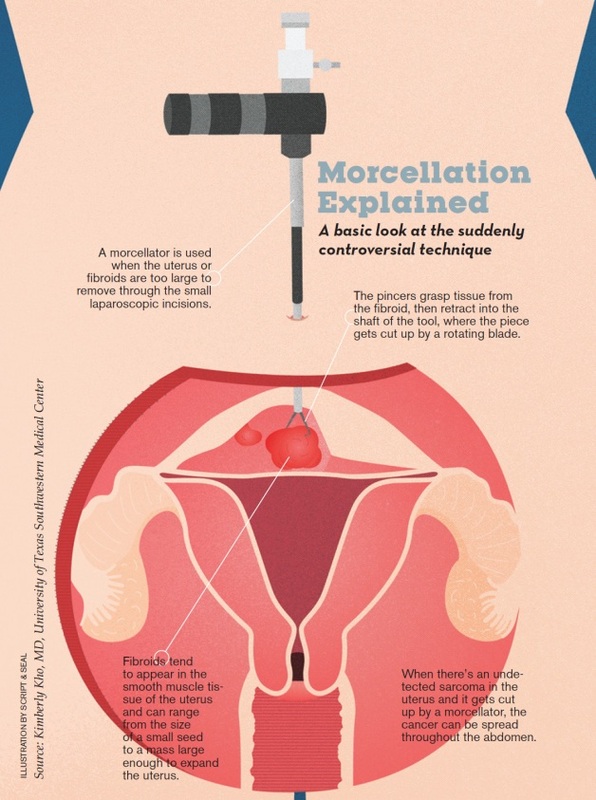 When the fibroids or the uterus is too large to fit through the small ports, the morcellator cuts everything into smaller pieces and they are sucked up into a tube. Seems reasonable right? Well the problem is that some of the smaller pieces of tissue can spray out into the body. Still, the surgeon must go in with suction and get those stray pieces, right? Sure. Or they can use a containment bag attachment that can help prevent some of the extra spray out of the removed tissue. The problem is this though: Some women have a “hidden” cancer ( leiomyosarcomas) that cannot be detected until the pathology tests post op. So, little bits of cancerous tissue land on other ares in the body and grow, causing the cancer to become worse. (Upstage. Going from a stage 1 to stage 3 or 4) Now we see the problem. There has been some debate on the actual numbers of women who have surgeries who also have LMS. Several doctors disagree with the numbers the FDA put out (similar to the ones I’ve stated above) and say the instances are even less. Some gynecologists and major medical centers had been quoting the risk of a woman having surgery for what are thought to be “fibroids” and being found to, in fact, have a leiomyosarcoma (LMS) as 1 woman out of 10,000. However, this number is incorrect. The rate of 1 in 10,000 is the incidence of LMS in the entire population of women, meaning that for every 10,000 women in the US (or elsewhere) 1 will have LMS. This is a very different number than will concern women with fibroids. Although many women will have some fibroids in their lifetime (77% of women by age 50), only a small minority (20%) will ever need treatment. For these women who have symptoms bothersome enough to need treatment for fibroids (medication, surgery, UAE, HIFU), the risk of having LMS had been previously been stated as 1 in 1,332, based on a study we published in 1994. So, that’s the first difference: 1 in 10,000 women in the entire population versus 1 in 1332 women who actually have fibroids and need surgery because of fibroids. Let me say this clearly: any study of surgery for fibroids where no LMS was found was excluded from the FDA calculation! This is a very large number of studies since LMS is a very rare disease and is infrequently found. Dr. Pritts looked at ALL articles where surgery was performed for fibroids and the pathology of all the removed tissue was both analyzed and reported in the paper. So, studies where the incidence of LMS was “0″ were included, as they should be. This very thing happened to a doctor in Boston, Amy Reed, which is how this whole debate began. She and her husband have been on a campaign to stop (even if temporarily) the use of power morcellators in fibroid surgeries. Several hospitals in the Boston area limited the use of mocellation (with bag only) shortly after she went public with her story and her concerns. Later, they enacted a full moratorium on morcellators. In April of 2014, the FDA (Food and Drug Administration) issued a warning against the use of power morcellators in uterine surgeries. Johnson & Johnson subsidiary Ethicon stopped selling its morecellators after the statement from the FDA . In July of 2014 after an open comment period, the FDA held a meeting on the safety, risks and usage of power morcellators. You can find some of the materials from the meeting here. There are several video presentations available on-line as well. Here are the links to a few. So where do I stand on this issue? I wouldn’t choose to have my fibroids or a hysterectomy dealt with by power morcellation. Why? I wouldn’t want to take the additional risk that I could spread an un detected cancer through my body. Surgery is risky enough. Even though the risk is low (less than 1%), its just not a chance I would be willing to take. The stakes are too high for me. HOWEVER, I will say I believe that more research is needed before completely banning its use. Since this has become an issue, several women have come forward to say they now have stage 4 cancer, and some have died (obviously their families speak for them) as a result of power morcellation spreading undetected cancerous tissue throughout their abdomen. I think the patient, should have the ultimate say in the type of procedure until there is definitive proof on the risk. There should be a way to test before having surgery to see if leiomyosarcomas are present. This way, the patient and doctor can make a safe surgical treatment decision. I’m an advocate of “My body, my decision” on medical issues anyway. As a patient, you have to ask all the questions, get as many informed, educated opinions and make the best decision for you, whether it’s for allergy pills or a surgical procedure. You have the right to make the decision you believe is best for your body and health that you are most comfortable with. 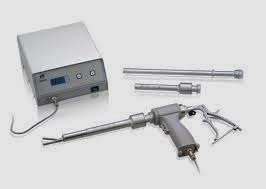 The fear for some women and doctors, is that options will be limited if the power morcellator is no longer available. Especially for those who face hysterectomy. Again, I say choice is key. More research and ways to pre screen for cancer can make this choice easier for patient and doctor. Which leads to the question I’ve had for a while: Why isn’t there more fibroid research? Would you choose this method for your surgery? Have you had a myomectomy or hysterectomy using power mocellation? Do you think there should be a permanent ban? I understand that for some cases, morcellation may be the best option to remove really large fibroids or for a large uterus. I’m not for taking the morcellator out of play, I just don’t know if I would choose it for me if it were offered at this point. I might change my mind in the future if my situation was different OR they are able to come up with better cancer pre screening. I had minimally invasive surgery to remove my fibroids, and I agree, its much better than basically being sliced from hip bone to hip bone and taking 2 1/2 months to heal. My surgeon just happens to not use the robot (davinci) or a morcellator.